Jeff Kagan, an independent analyst cited in a new whitepaper published by Harvard Business Review says that the landscape of mobile technology and application development is “…like the wild, wild West out there”. There are no rules to limit what kinds of applications you can develop. New applications, and new ways of utilizing the mobile technology embedded in the device, are constantly being imagined and created. Take the ways that mobile technology and applications are being used in all the different industries. 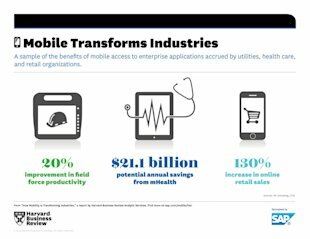 According to the Harvard Business Review whitepaper “How Mobility is Transforming Industries,” Healthcare is using mobile to increase patient care quality, and decrease wait times for diagnoses. Utilities are boosting productivity for their mobile workforce by rapidly analyzing asset and service performance, and are increasing customer service by tracking consumptions trends. Even those industries that are typically slower adopters of technology – such as farming – are finding the mobile technology frontier a boon to their industry. The agricultural industry is using wireless soil monitors attached to plants to monitor growth and with the data they collect, they can be better stewards of their land and water resources. It seems like each new day brings announcements of new technology, or new ways that current technology is being used. There doesn’t seem to be an end in sight. Just like that wild, wild west adventure, each new advance in technology turns a page in the tale of mobility. What can you dream up that might be on the other side of the next development? Read the whitepaper and see the short video on How Mobility is Transforming Industries today, and start your own adventure!